The Wacker Neuson EZ53 zero tail excavator is a high performance and economical machine, comfortable to work with and profitable with all its features. The compact machine with zero tail swing is characterised by flexibility in use and a great deal of maneuverability. 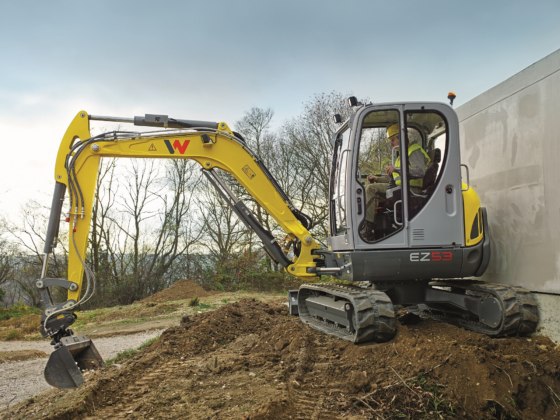 Despite its compact size, the zero tail excavator EZ53 with 5.2 tons of operating weight can achieve an optimal excavation performance even in hard-to-reach places, because at no point does the rear of the machine project over its undercarriage. The minimised space requirements are particularly practical on construction sites in busy city centres or on road construction sites with ongoing traffic. The cabin interior is designed to be spacious and ergonomic, with a clear design arrangement which enables safe and comfortable operation. All maintenance components such as fuel, air, oil and hydraulic oil filters as well as the water and hydraulic coolers, are easily accessible thanks to the laterally placed engine and the tiltable cabin. In addition, the side panels are easy to remove. Necessary service work can be carried out directly on site easily and in a time and cost-saving manner – which is practical and maintenance-friendly. Up to five auxiliary control circuits make it possible to use a variety of attachments and therefore providing more flexibility for the contractor. Low clearance heights are also not an obstacle: The cabin or the canopy can easily be removed by loosening four screws. These compact, robust machines can optionally be fitted with the Vertical Digging System (VDS), the revolving superstructure of the excavator can be continuously tilted up to 15 degrees. This allows for vertical digging, even on sloped surfaces, which makes the machine even more flexible. Slopes of up to 27 percent can be effectively compensated. Operators can work in an upright and comfortable position. Productivity and effectiveness are measurably increased by VDS during excavation work. Overall VDS can provide material and time savings of up to 25 percent when excavating and backfilling. The latest technologies ensure reduced fuel consumption with a simultaneous increase in engine and hydraulic performance. The turbo diesel engine with an output of 36 kW provides optimum digging performance for higher materials handling.